In New York earlier this month we were browsing Chelsea Market and stopped at Sarabeth’s to grab a quick bite. I had a breakfast muffin that had a soft boiled egg inside of it and it.was.INCREDIBLE. It reminded me that I had a very similar muffin in San Francisco at the famous bakery Craftsman and Wolves a few years ago. If you don’t live near New York or SF…this is my copycat recipe of those muffins that you can make in the comfort of your own home! The answer is YES. YOU NEED TO TRY THIS! Let me take you step by step to make the process less scary. STEP 1: MAKE 6 SOFT BOILED EGGS. But wait, how do I make soft boiled eggs? Have an Instant Pot? Great! 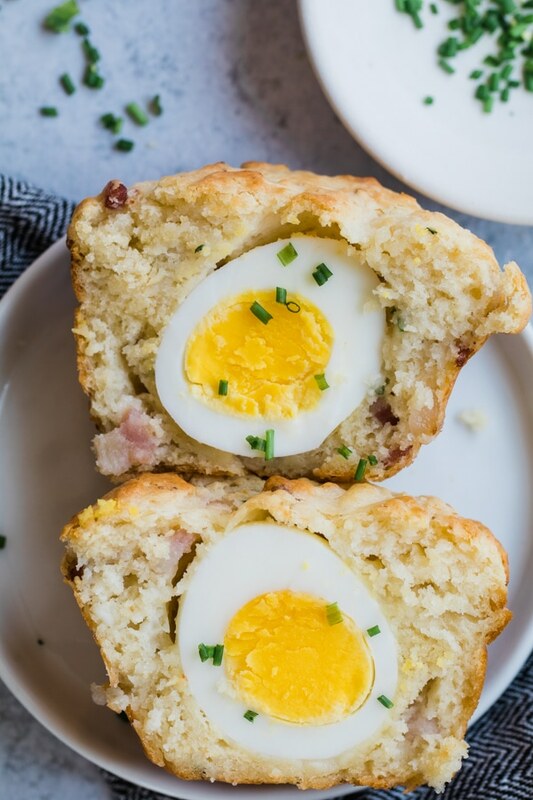 Let’s make the perfect soft boiled eggs in your Instant Pot for these breakfast muffins! First, pour 2 cups of water in your Instant Pot. Place the steamer/trivet on the bottom and place 6 eggs on top. I actually make 7 eggs just in case an egg decides it wants to explode! Put your lid on the Instant Pot. Plug it in. Set your Instant Pot to low pressure for 3 minutes. Turn the valve on top of the Instant Pot to sealing. This will actually take closer to 10 minutes since your Instant Pot needs to come to pressure. Take the lid off, and place the eggs immediately in a bowl filled with ice and water. Let the eggs chill in the ice bath for 30-60 seconds. Remove from ice bath, peel. Done! Bring water to boil in a saucepan. Then reduce it to a rapid simmer and gently add your eggs into the sauce pan one at a time. You might not be able to cook 6 eggs in one pan, so you may need to cook them in batches. 4 eggs at 1 time max. COOK THE EGGS FOR 6 MINUTES. Set a timer!! While the eggs cook you can prep you water ice bath. In a bowl, fill with ice and water. When the eggs are done place them in the ice water for 30-60 seconds. Peel & done! Once you have your muffin batter prepared and ready for the muffin tins, scoop 2 Tbsp. of the muffin batter into the prepared muffin tin. Then, take your soft boiled egg and gently press it down into the batter. Cover the egg with more batter on and around the sides of the egg. It’s as easy as that! Just like the image above, press the egg into the batter and then you will cover the egg with more batter. You may need to smooth the batter out a little bit, but make sure the egg doesn’t peak through the top! STEP 3: BAKE AT 450F AND BAKE FOR 20 MINUTES! And there you go! Easy, huh? These breakfast muffins will totally make you look like a Master Chef! Not convinced on this recipe? One of my other favorite egg breakfast recipes is the high protein egg quinoa scramble! Or try my Avocado Topped with Cheesy Scrambled Eggs recipe! Instead of cottage cheese, you can use cheddar or mozzarella. Instead of pancetta, you can use ground sausage, ham or bacon bits! Instead of all purpose flour you can use 1 cup chickpea flour and 1 cup millet flour. Are a fun way to switch up for breakfast routine. Less intimidating than you think, trust me! Great for brunch or meal prep. Satisfying and a healthy way to start your day. I hope you enjoy this weeks #MUFFINMONDAY series – if you make any of my muffins be sure to tag @krolls_korner so I can see your beautiful creations! 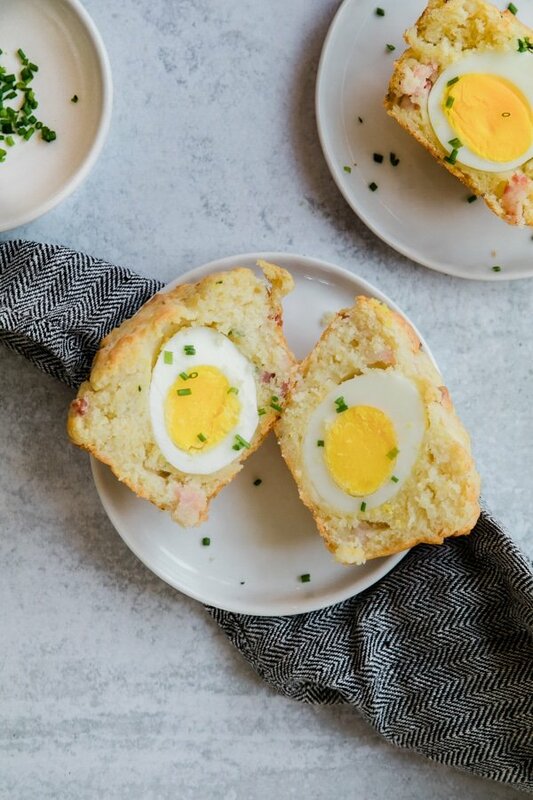 A two in one – a hard boiled egg and a delicious breakfast muffin. 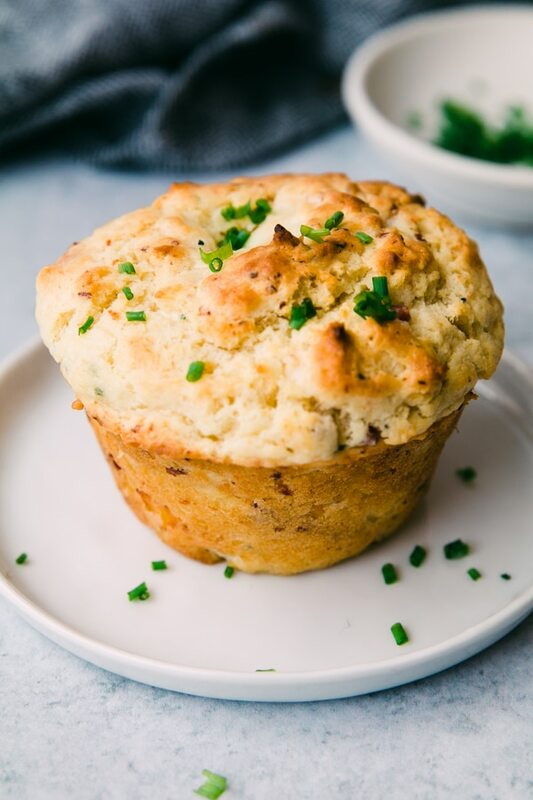 These satisfying, easy, make-ahead breakfast muffins are savory and an all-in-one muffin! If you haven’t prepped the soft boiled eggs, make them now. Directions on how to make soft boiled eggs are in this blog post above! In a large bowl, mix your flour, baking powder, sugar and salt together. In a separate small bowl, mix the milk, butter and egg together. In another separate small bowl, mix your pancetta (or meat of choice) cheese and chives. Pour the butter mixture into the flour first and mix. Then pour in the cheese mixture in, and mix. Be careful not to over mix! Place 2 Tbsp. of muffin batter into prepared muffin tin. 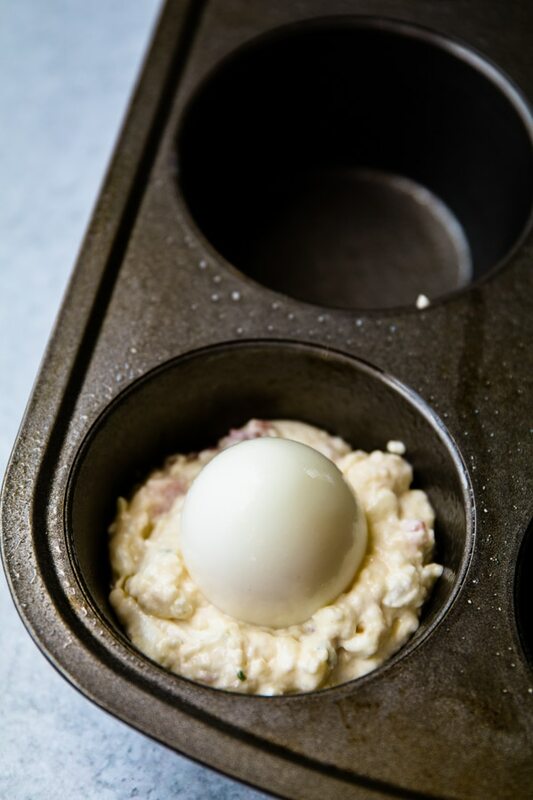 Carefully place soft boiled egg in the center of the muffin. Then scoop more batter on top and around the muffin to cover the egg. Repeat with remaining muffins. Bake for 20 minutes or until tops of muffins become golden brown. Enjoy warm with hot sauce! 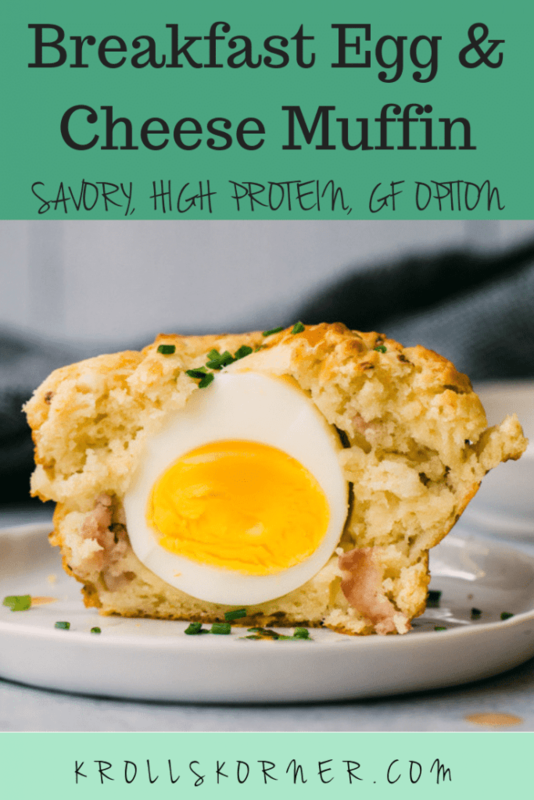 PIN THESE BREAKFAST EGG AND CHEESE MUFFINS FOR LATER! These look AHmazing! Perfect meal prep recipe. Pinning for later!